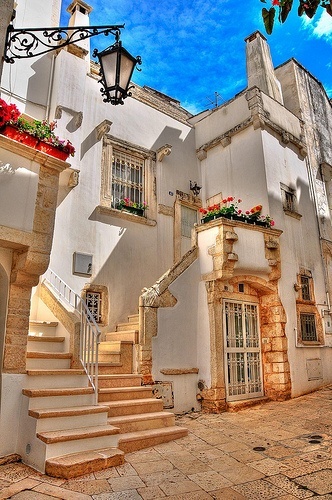 Martina Franca is a town and comune in the province of Taranto, Apulia (Puglia), Italy. It is the second most populated city of the province after Taranto. Since 1975, the town has hosted the annual summer opera festival, the Festival della Valle d'Itria. The town has a particularly beautiful "old city" surrounded by stone walls with prominent Baroque gates leading to piazzas and narrow, winding streets. Piazza di Roma is the largest open space in the old city, with a greenspace in the center of a largely triangular grass pattern, facing the 17th century Palazzo Ducale.